Born into a family of artists, Sarah grew up in the Frome valley of Dorset. She attended Wimbledon School of Art and Falmouth College of Art. During her time spent in Falmouth, she was drawn to the landscapes of the West Country. 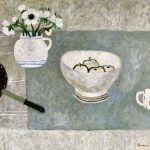 She then moved to Edinburgh as Gallery Director to Nexus Galleries, a collection of three contemporary art galleries where she was much influenced by Scottish artists such as Elizabeth Blackader and William Gillies, and subsequently began working on still-lifes. 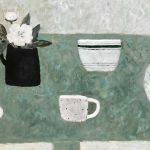 Sarah has had solo and mixed exhibitions throughout the UK and won the Mary Fedden award at the Royal West of England Academy Open Exhibition. 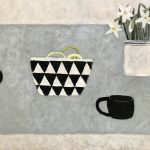 She has been a regular exhibitor at the RA Summer Exhibition. 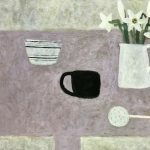 Sarah now lives in Devon where her husband owns an art gallery and there are similarities in her current work to the Cornish based St Ives School in her combination of landscape and still-life often glimpsed through an open window. Equally important to her development was a trip to Tuscany in her late teens to see the renaissance fresco paintings. The use of the trompe l’oeil device of the window looking on to a distant landscape and a foreground narrative framing a distant view, a delight in the primitive and unscathed landscape, as well as the dry scumbly texture of her paint, even tonal values, and the gentle muted palette, occasionally illuminated by a flash of rather post-renaissance electric pink, purple or blue, all reflect this influence. More recently she has turned to pure still life painting. 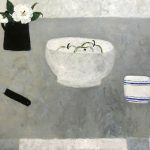 In these simplified compositions, objects are sparingly arranged with deceptive economy, balance and tone are deliberately and carefully orchestrated. She uses a restricted, structured palette, to alter a single tone or more an object would disturb the complex balance between forms which seem held in suspension on the painted surface.